So in just a handful of hours, the world will be getting ready for parties, midnight kisses, counting down from the fine number, 10 (hopefully starting at 11:59:50 on December 31st), and…. you guessed it, drinking some sparkling wine! Sparkling wine is something I have enjoyed on many celebratory occasions – usually on New Year’s, graduations, weddings, Sunday brunch, etc. And while I enjoy the dry or sweet bubbly delight, I don’t know much about it. So here in this educational journey about wine, I thought I’d start the New Year with a little info regarding sparkling wine. So, there is a pretty wide selection of sparkling wines – some are known by the region they are from, and others are just referred to as “sparkling wine”. But not only do they just have different names, there are generally different qualities about them – all have bubbles, but that’s about where the similarity ends. So we’re all comfortable saying, “I’ll take a glass of champagne” in our best snobby wannabe French accents that really are more like bad Queen Elizabeth-esque accents. You may have guessed that Champagne is the mother of all sparkling wine. It represents approximately 8% of the world’s sparkling wine industry and is from the north eastern region of France. Now here’s what surprised me – common grapes used for making champagne are Pinot Noir and Chardonnay. Huh… Doesn’t that surprise you!? I guess I just figured it was it’s own fancy grape, but I guess not. So anyway, there’s the skinny on champagne. Aaahhh, cava. I have a special relationship with this Spanish sparkling wine. After spending a few months in this beautiful country, I spent many a night drinking many a glass of cava. Cava is made in the “traditional” method of sparkling wine making, which is to say that it is made like champagne (from Champagne). Most cava – 95% in fact – is produced in Cataluña, which is the northern region of Spain. While cava is enormously popular, its production is only about a third of that of champagne. One of the biggest cava-makers is Freixenet – you may recognize it from the black bottle that you can typically find in your local grocer for somewhere around $8-12. 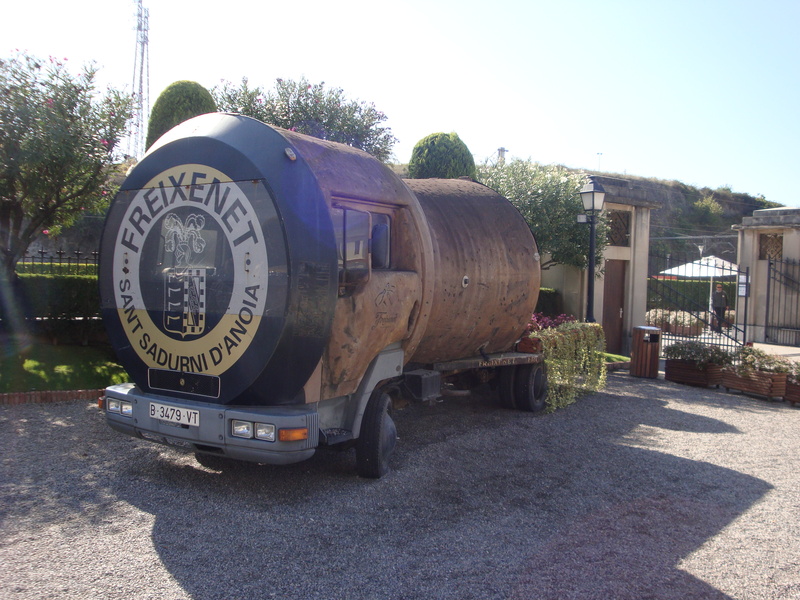 I have had the pleasure of visiting the Freixenet winery in Cataluña, so you’d think that I would know they are one of the biggest producers of cava. But hey, they were speaking Spanish, and I was drinking cava samples, so I didn’t pick up on that fun fact. Here’s a little pic of the winery…. Hold up. I know what you’re thinking. Soviets and sparkling wine? You thought they just drank vodka, right? Well you’re wrong! Apparently “Soviet Sparkling Wine” has come to be the PC term for “Soviet Champagne” aka “champanskoe”. I like that. Soviet sparkling wine basically came about because some Russians really liked champagne (like the real stuff, from Champagne, France), but it became expensive to import, so those the people of Russia (late 19th century) started making their own bubbly wine. Soviet sparkling wine primarily uses grapes grown in Crimea and Ukraine. I can’t really tell from my resource guide here if this is still made… I’m guessing it is, but I’ll have to hit that up on a future blog post. Asti is Italian sparkling wine… one many of us may have tried in our earlier sparkling wine years because it is delightfully sweet. (And we all know college kids love sweet booze.) It is made from a variety of grapes, including Barbera, Dolcetto, Freisa, Grignolino, Malvasia, and Moscata d’Asti. (Don’t worry – I haven’t heard of most of those either.) As I started reading about Italian sparkling wine, I realized there is quite a bit to know – too much for this post. So I’ll leave it at that for Asti, for now. While there are many other types of bubbly out there, I’ll call it quits on this initial sparkling wine “research” to go enjoy a glass. May you enjoy a delightful sparkling wine as you end 2011 and turn to 2012. Here’s to hoping that 2012 is a great year for discovering wine! (The majority of the data points in this post were from The Oxford Companion to Wine).